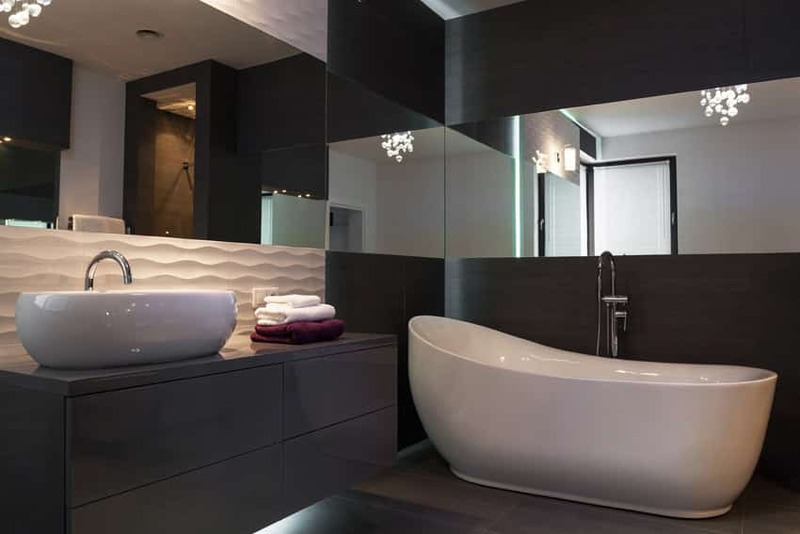 This modern bathroom combines dark colors with bright & refreshing colors. The contrast of the charcoal ceramic tiles with the sky blue paint and light beige wood ceramic floor tiles is surprisingly refreshing and interesting, creating an effect that the bathroom is completely divided into two different areas. The “light” area being the entry and the vanity area with white wall tiles and beech wood vanity counter, and the dark area being the bathtub and shower area. 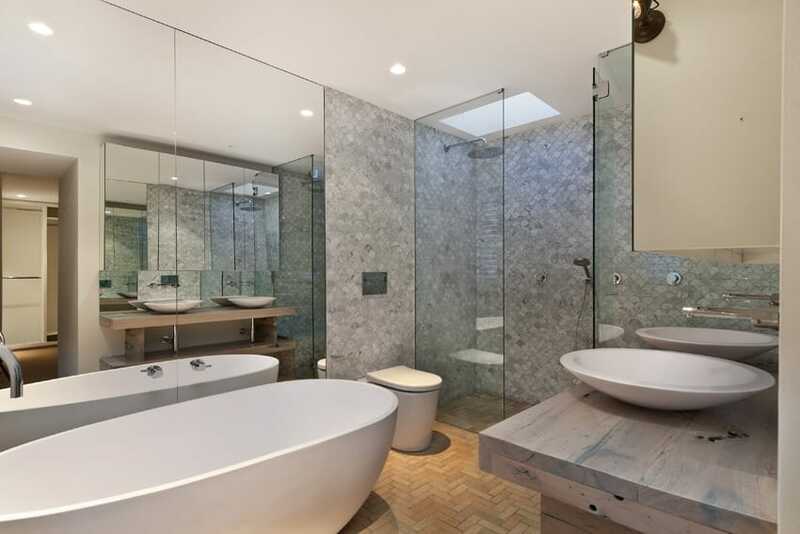 This bathroom uses a combination of classic and very modern materials to create this look. On the floors and on the walls are beige natural stone tiles with accent strips of mosaic tiles, giving that classic and elegant appeal. On the other hand, the vanity and the storage closes uses a black mirror finish, mostly attributed to modern designs. The combination is interesting, giving the otherwise classic and simple look of the bathroom look more updated. 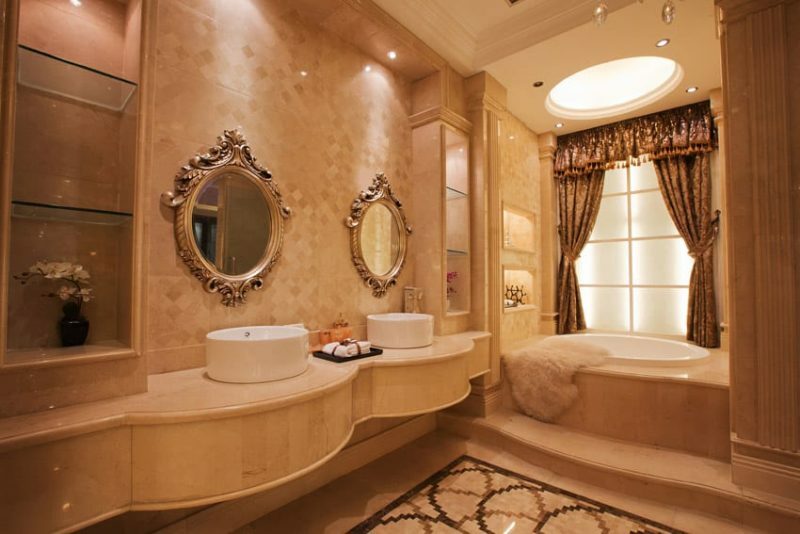 This elegant bathroom is fit for a royalty. The combination of luxurious finishes and materials gives this a very regal and expensive appeal. 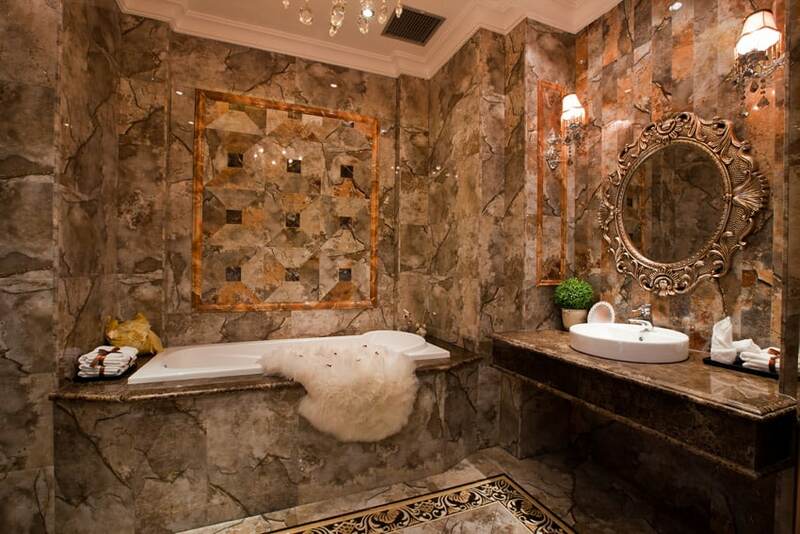 From its marble floors, patterned marble floors, ceramic wall tiles that has a very wallpaper-like effect, faux columns and niches, marble-clad vanity, silvered bathroom mirrors and a grand bathtub, you will surely feel like a royalty once you step into this bathroom. This classic bathroom is all about the golden hues of yellow. From the floors, to the walls, to the bathtub and even up to the sink, you will notice how this bathroom favors various shades of yellow. The floor are polished natural stone tiles in a Moroccan Arabesque shape, giving it much personality on its own. 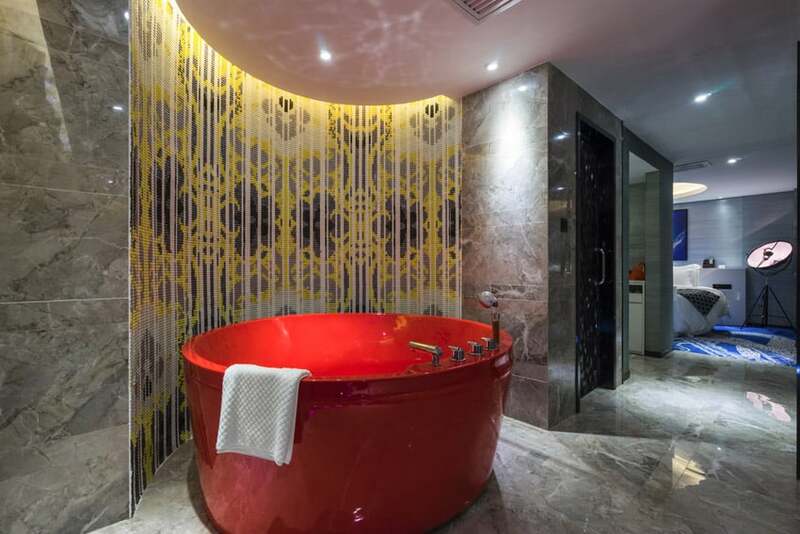 The polished natural stone cladding for the bathtub and the vanities’ counter top can be seen using a similar shade of golden yellow, and the mosaic tiles uses golden yellow tones as well. A simple bathroom with Asian inspiration. You can see Asian accessories used as art, decor, and even practical items such as the shampoo holders, etc. To emphasize the Asian look, Jade-colored ceramic tiles were used for the bathtub area and it also uses gold fixtures to really achieve the look. The rest of the bathroom is kept in a low-key beige color for balance. This is a very gorgeous modern bathroom. 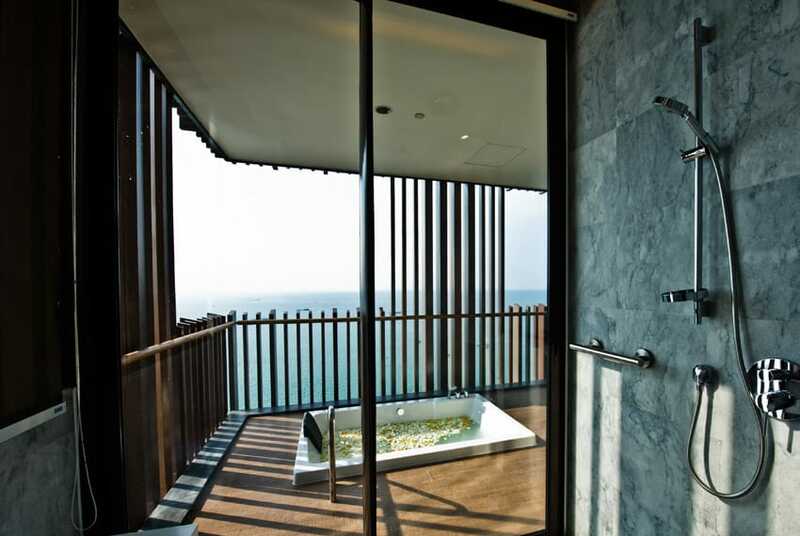 The shower are is placed beside a sliding door going to the covered patio area which has a view of the sea. The shower area uses simple gray stone tiles for its walls, and going outside, you will see the square bathtub right in the middle of the patio area, only surrounded by the vertical wood railings. This modern bathroom has direct access to the bedroom separated only by a large opening, fringe curtains and a roller shade. 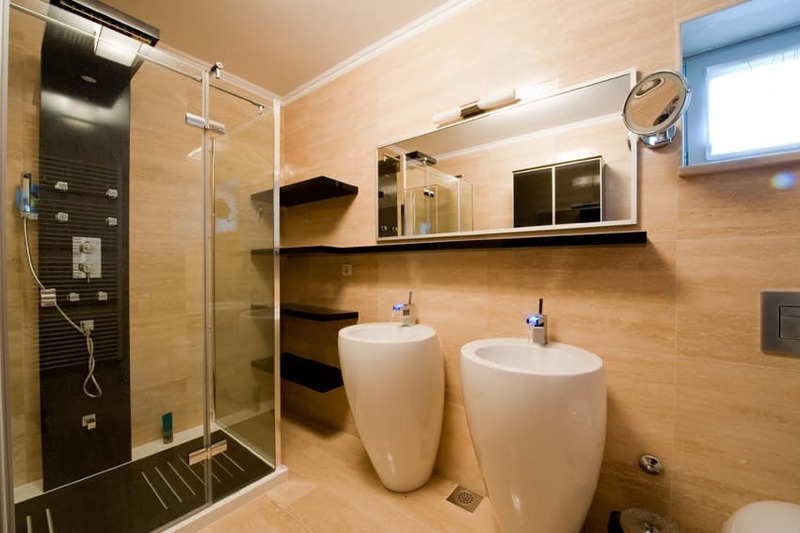 Inside the spacious bathroom, the shower and the bathtub occupies one corner each. Walls are simple white ceramic tiles and the walls uses beige-colored tiles with varying widths to help add a nice simple pattern on the walls. 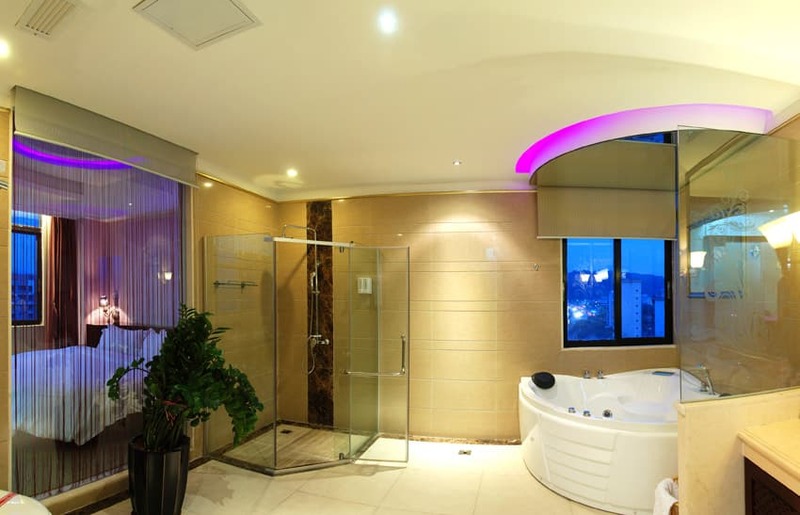 Additionally, you will see the use of LED lights on the coves, both in the bathroom and the bedroom, giving it a sort of futuristic effect. 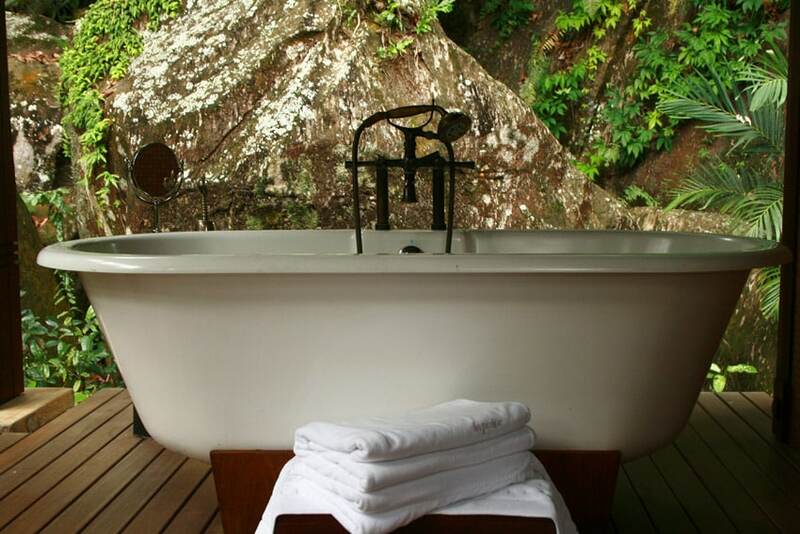 A very relaxing bathroom with very natural surroundings. 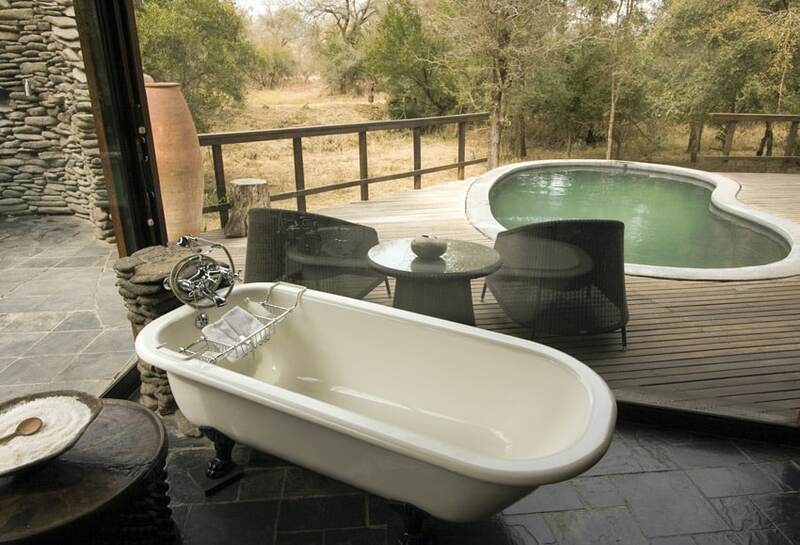 Placed in an open and raised patio, this free standing bathtub will help you relax and take you closer to nature. It was placed on teak wood decking and surrounded by no walls, only wooden posts and nature itself. An ultra modern bathroom doesn’t have to be all glossy materials and hard edges – textures and patterns are also welcome to give the space more personality and dimension, like in this example. You will see the unique texture of the black floor tiles and the concrete walls, as well as the faux stone wallpaper placed near the shower area. For the raised shower area which is only partially divided from the rest of the bathroom through a panel of orange tinted-glass, it uses very wide ceramic tiles in a light yellow color, and uses it for the wall of the shower area, too. This bathroom focuses on the use of simple but elegant materials to achieve a well put-together design. 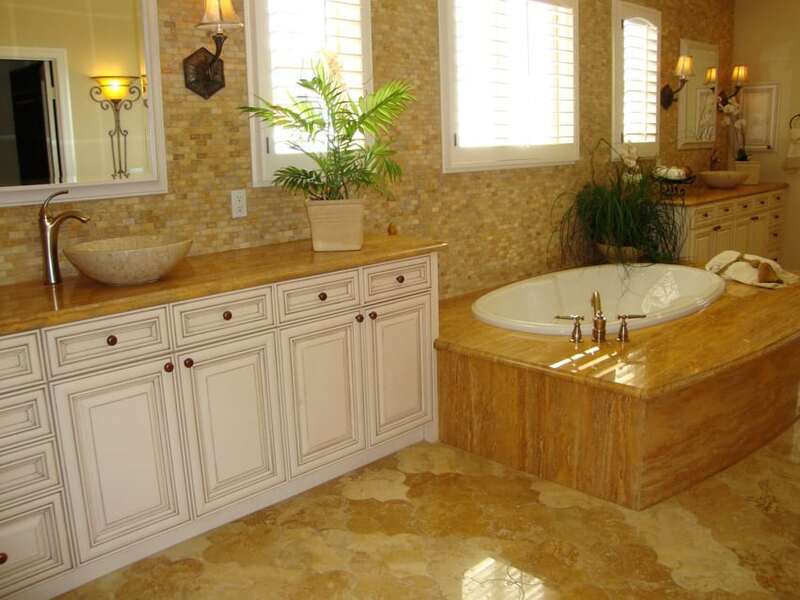 In this case, you will notice that beige travertine tiles were used on both the floors and the walls – a material which is considerable expensive. To add a little bit of variety to the space, wengue-stained shelves were used for storing towels and as a small ledge for the vanity area. 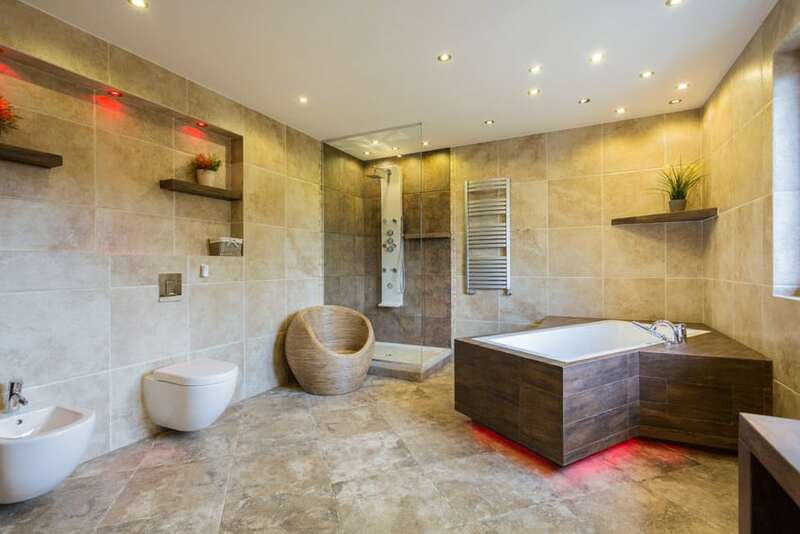 This modern bathroom is a little small, but the continuous horizontal pattern used on the wall and floor tiles help give an illusion of a larger bathroom. Upon entry, you will first see the frame-less glass-enclosed shower area, and beside it is the bath tub. On its walls are gray tiles with a grungy texture, the floors uses the same pattern and texture for its tiles, but is brown instead of gray and the rest of the walls uses a more low-key satin finish light beige quartz tiles. 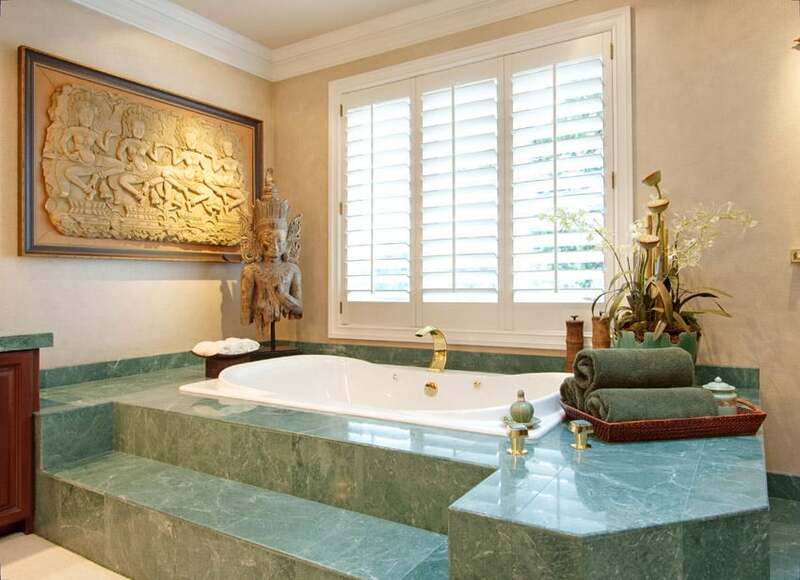 One way of bringing the outdoors indoors is the use of outdoor-grade materials, like in this case, the emerald colored natural stone tiles used for the floors. This adds an interesting variety of textures and patterns for the floors, and even provides a more earthy feel to the space. 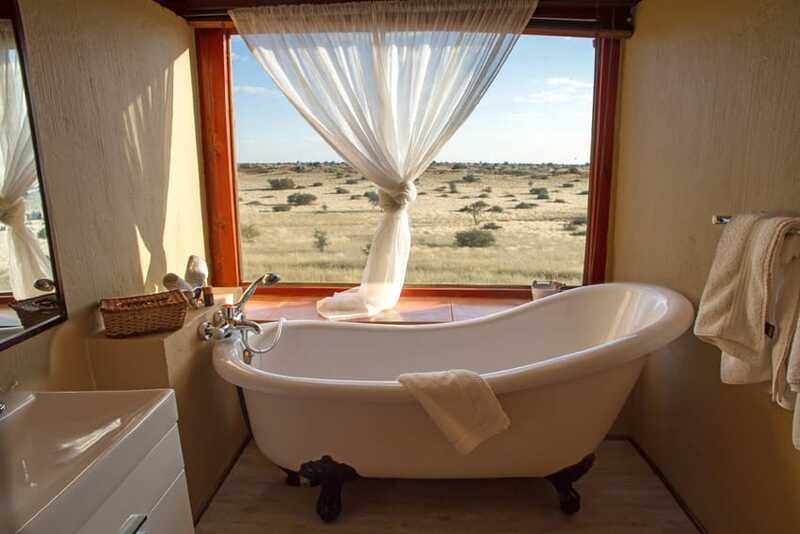 The free-standing bathtub was placed right beside floor-length windows, giving you an amazing outdoor view while you soak and relax. A simple modern bathroom which uses blue-green accents to give the space a more refreshing appeal. The floors uses solid Mahogany, while most of the walls uses wide white ceramic tiles to tone down the redness of the floors. 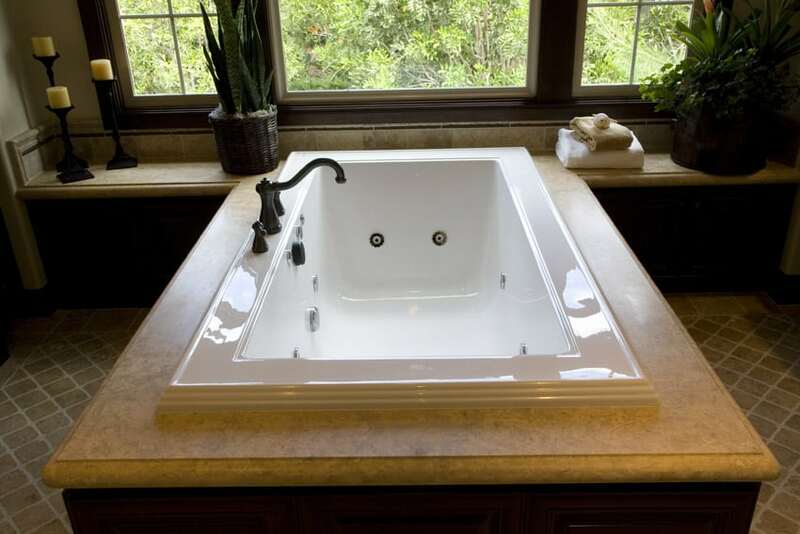 Even the wall-hung vanity sink is laminated in a glossy white finish to avoid clashing colors. 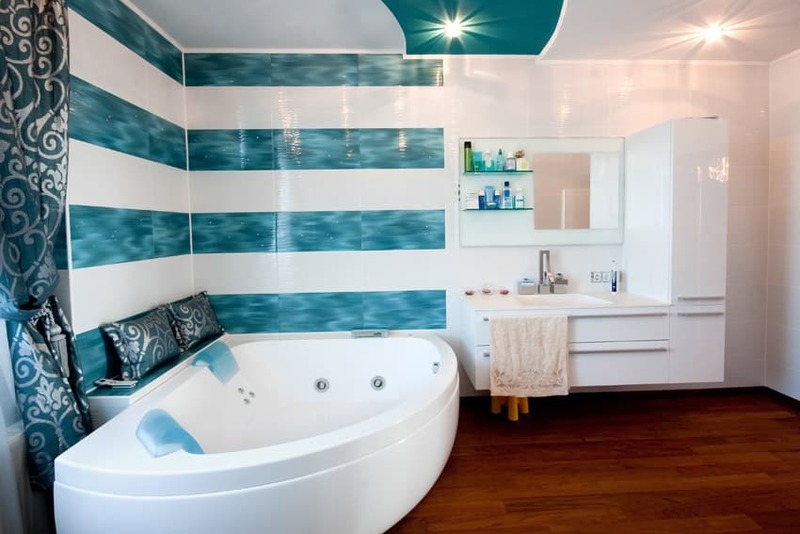 For the bathtub area, you will notices horizontal strips of accent tiles in a blue-green color and featuring an interesting pattern reminiscent of pool water’s surface. The accent pillows and curtains even uses the same color, helping unify the over-all color scheme. The beauty of this bathroom is not only in its elegant materials, but also because of its fearless use of bold colors and unique floor plans. 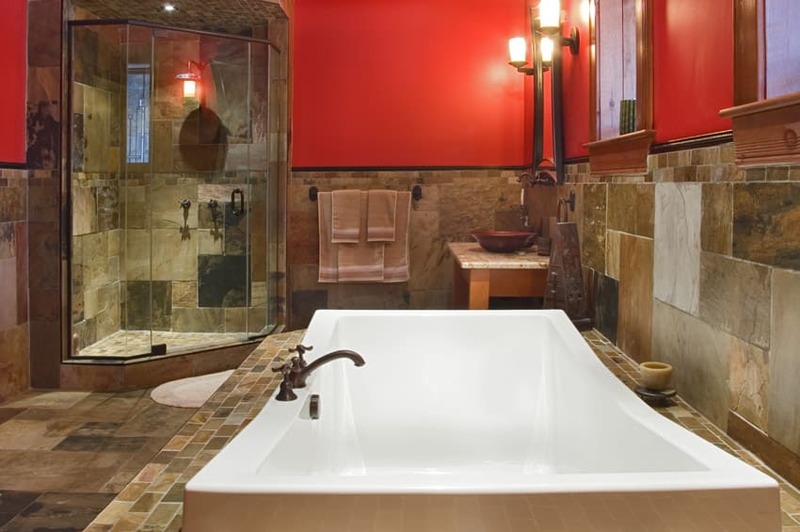 While the main floors and walls uses basic marble tiles in a beige-gray color, you will notice the bold red circular tub placed in the middle, in which the wall forms a semi-circular depression to accommodate the tub. This semi-circular wall is then clad with mosaic tiles forming an elegant pattern made up of yellows, lilacs, purples and dark grays. Mirrors help give an illusion of a bigger space, and in this example, that effect is demonstrated. Although mirrors used are not floor-to ceiling height, the continuous horizontal strip of mirror on all the walls of the bathroom still serves its purpose of extending the space. This is also helps bring in additional brightness into the bathroom considering that dark gray ceramic tiles were used on the floors and walls, except for the wall in which the white vanity is against which uses white 3D tiles. This bathroom design is so simple and straight-forward. It uses polished sandstone tiles all throughout the floors and the walls of the bathroom, emphasizing the simple elegance of the material. The shower area is not fully-enclosed, but only has a floor to ceiling frame-less tempered glass between the shower area and the vanity. This is another small bathroom with a rather small floor area. 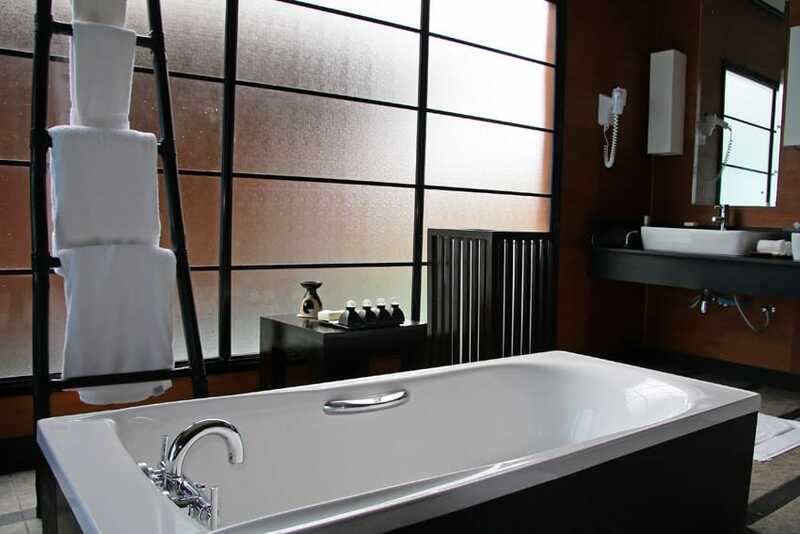 It uses a minimalist black & white color scheme, which helps on keeping the bathroom low-key but still elegant. On the floors and half of the walls, wide black ceramic tiles with horizontal grain patterns were used, while the rest of the walls uses a same-sized tile but in white and has a less-noticeable grain. The white fixtures and cabinets contrasts well with the black tiles on the floors and walls, bringing out and emphasizing its locations. While the bathroom itself is very simple and minimalist – white floors with accent walls clad in turquoise mosaic tiles, the interesting feature of this bathroom is the unique bathtub. This bathtub is placed on a solid wood base, and the bathtub itself is made from thick panels of tempered glass, revealing a wooden lounge inside the tub to help you get into a relaxing and comfortable position inside the rater angular tub. This bathroom is rather experimental with its combinations of materials, colors and even floor plan/layout. On the right side is the shower area with a curved glass panel separating it from the rest of the bathroom. Its walls are clad in light gray tiles and has black accent tiles with silver patterns. The floors are from oak-stained wood decking material, and the rest of the bathroom floors uses dark gray 60×60 ceramic tiles. The wall in which the wooden vanity and the wall-hung water closet were placed is clad in natural limestone tiles, adding a rougher texture to the space and is even combined with Oak-stained wood panels with integrated lighting. The smart use of space helped maximize this small bathroom space and made it look rather spacious. While the floors and walls are very simple – clad in beige granite tiles and uses purple-black mosaic tiles on the wall niche, the use of wengue-laminated wooden items helped add more personality in the space, giving it a more Asian appeal. At first look, this bathroom can pass as an all-white bathroom, but you will notice that the walls & floors are actually clad in light warm gray ceramic tiles, giving enough contrast of colors between the white fixtures and cabinets. This also helps balance the coolness of its white tones and brings in a warmer tone into the space, making it look more welcoming. Simple and elegant, this bathroom embodies modern simplicity and classic elegance of French design. As such, a combination of whites and creams seemed the most appropriate combination of colors to achieve such look. Half of the walls were clad with cream-colored mosaic tiles, while the upper half of the walls was simply painted in white. The paneled cabinet of the vanity uses an off-white paint color to give it a sort of aged look, and the mirror used was framed in white-painted carved frame. The use of a variety of gray tones in this bathroom design gives it a light and soft look. 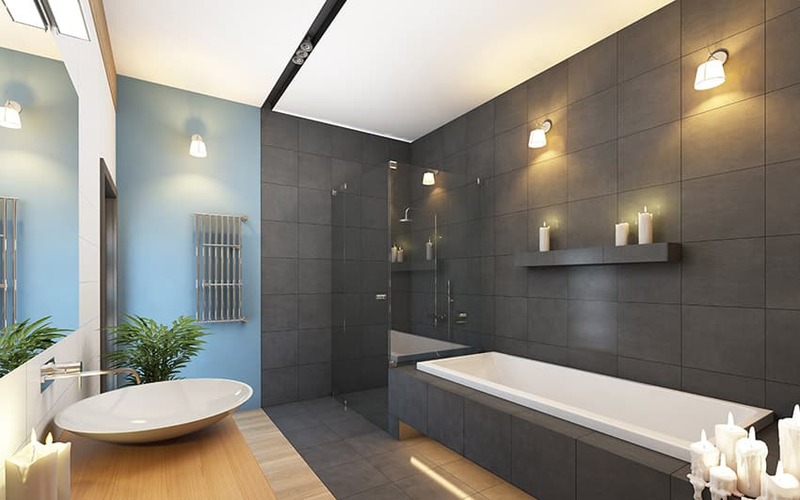 Most of the walls of the walls are painted in a light gray color, except the enclosed shower area which uses thin strips of gray ceramic tiles. Floors are a warm tone of gray marble, giving a soft spray of pattern to the space, while the rest of the fixtures and cabinets are white, a welcomed contrast to the creamy gray surfaces. 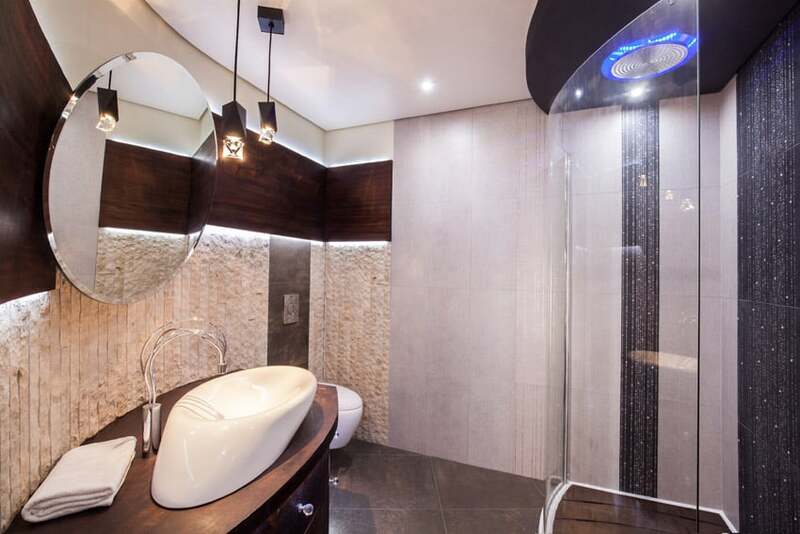 This bathroom design welcomes a variety of patterns and materials, creating a very unique and interesting bathroom design. Floors uses wood-liked tiles forming a diagonally-oriented herringbone pattern. On the walls, you will notice the pearly bluish gray tiles which forms a scale-like pattern. The wall in which the free-standing bath tub was set against however, uses a floor-to ceiling mirror in which you can see the solid wood vanity which uses mirror medicine cabinets. 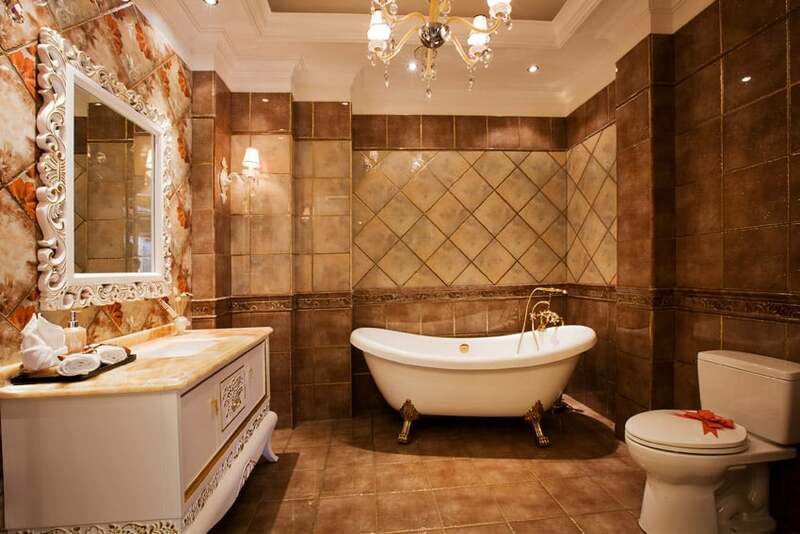 The choice of colors and materials on this bathroom gives it quite a heavy and intricate appeal. Walls and floors uses brown marble and even uses intricate border tiles on the floors in black, white and gold. The built-in vanity counter is clad in brown granite, and mirror used is carved, round and has a metallic finish which seems to blend in with the natural stone tiles used on its walls. 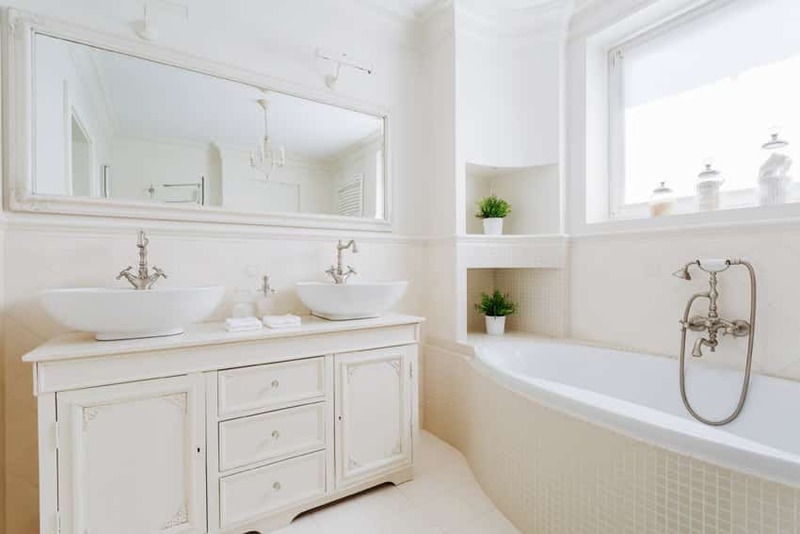 This is another example of an all-white bathroom. The floors and walls are clad in carrara marble, and the rest of the walls which are not that exposed to much moisture is simply painted in semi-gloss white paint. 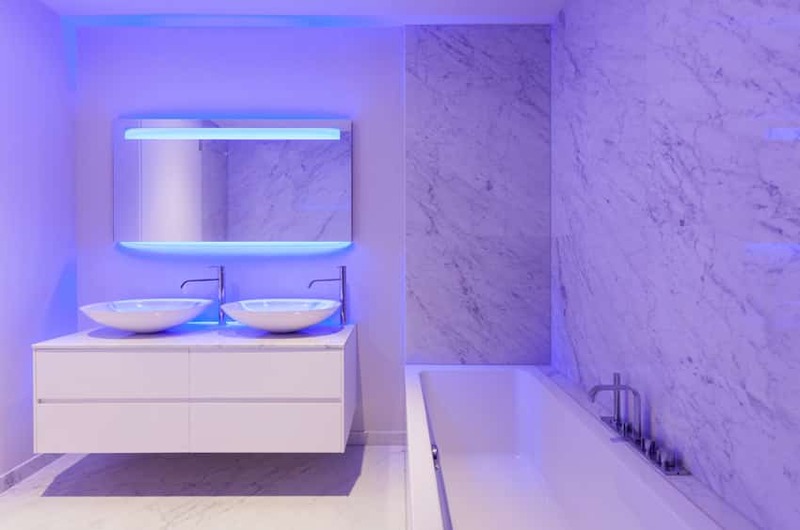 What makes this bathroom a bit different is the use of blue lights concealed behind the mirrors, giving the whole bathroom a blue tinge instead of a pure white. 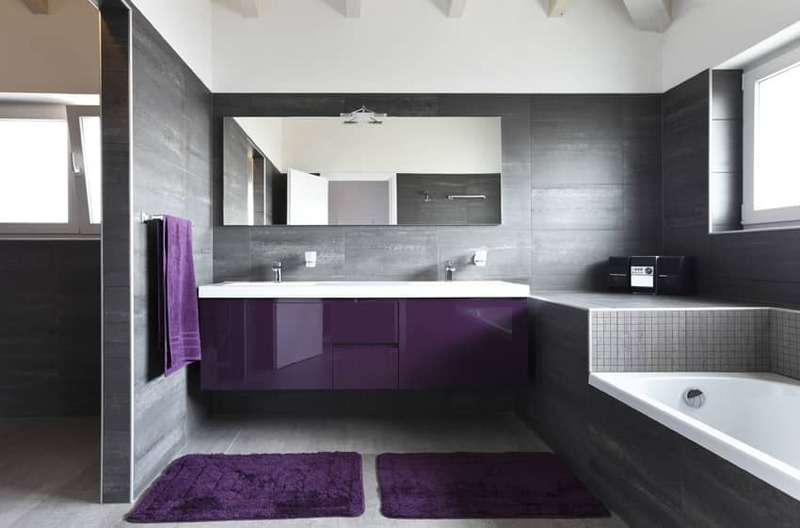 Violet is a color often associated with royalty, and for a dark-colored modern bathroom such as this one, it helps add a touch of elegance to the space. All walls were clad with wood-textured tiles in a dark gray color, while the floors uses a warmer and lighter gray variant for the floors. To add that touch of violet, the vanity was laminated in high gloss violet, in addition to matching rugs and towels in the room. Since wood is a sensitive material, especially when exposed to moisture, ceramic tiles which mimics the look of wood is a great alternative if you want to have that warm wood tones in your bathroom design. 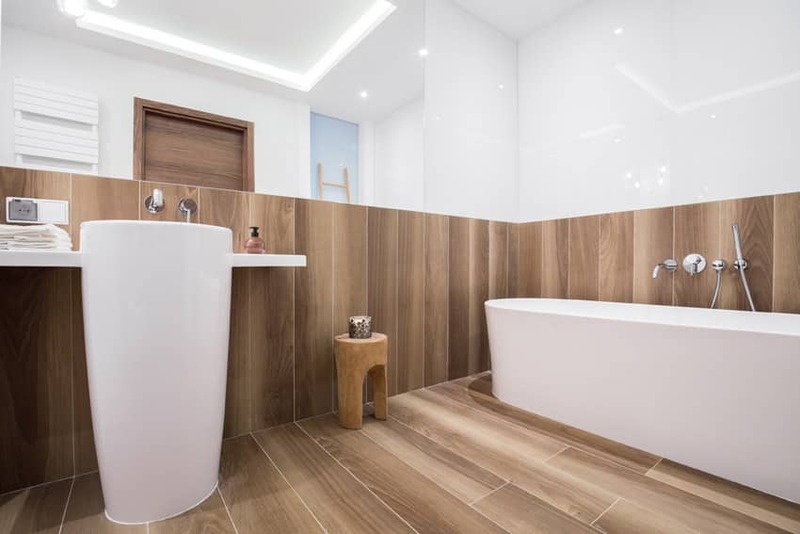 This modern bathroom retains its semi-gloss white walls, while the floors and half of the walls are clad with vertically-oriented ceramic tiles with wood-like design. 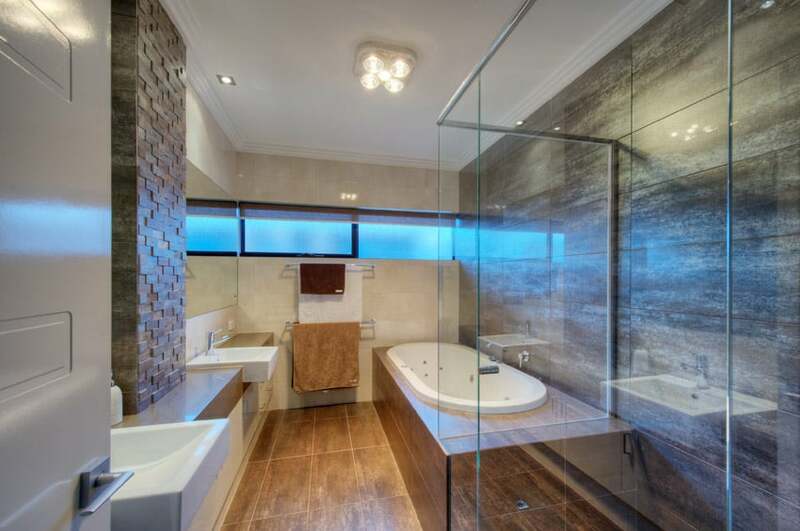 The main selling point of this bathroom would be its large picture windows on two perpendicular walls. Being placed near the corner of these windows, it gives you a view of both the patio area with wood decking and small soak pool, and the other side which seems like a patio as well but has stone walls covering it for privacy. The flooring used on that patio is the same one used inside the bathroom itself, making it seem like it is part of the outdoors. Quartz stone offers the same elegance as granite, but looks simpler, which makes it a perfect material for modern bathrooms. 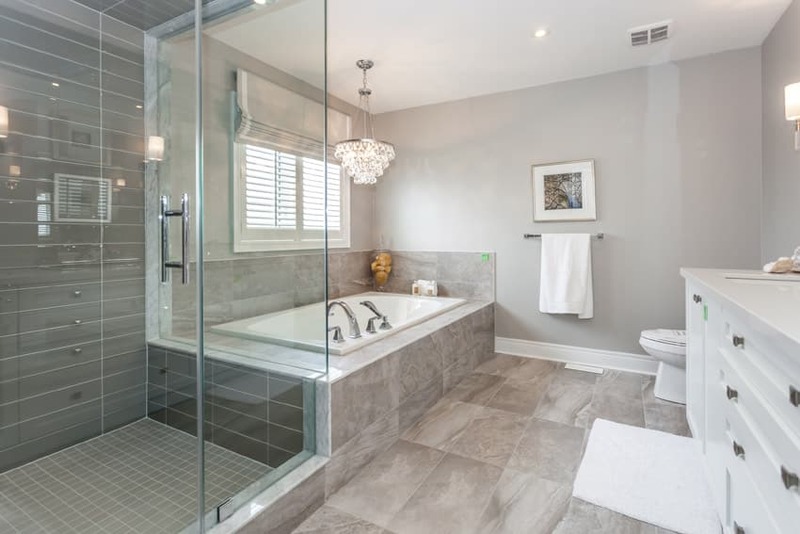 In this built-in tub example, you will see the extensive use of a light beige colored quartz stone on both walls, surrounding the tub, its face and probably even the floors. This is a very simple bathroom, a little bit narrow, but is compensated but the amount of light which enters the large picture window by the free-standing bath tub. Walls uses textured wallpaper in a creamy yellow color while the floors are dirty white and the vanity is a simple laminated white. The creamy yellow walls seems to match well with the dried grass which could be see from the window. 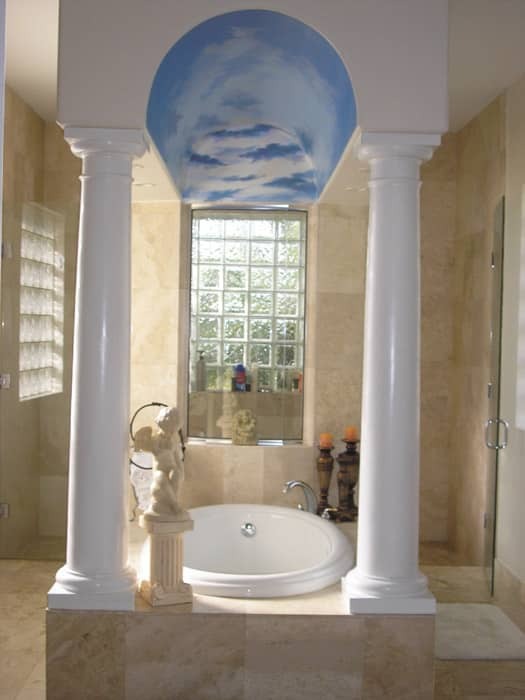 Despite its small size, this bathrooms attempts to make your bath tub feel ‘grand’ by placing it on a raised platform, placing faux ionic columns and placing classic carved decor around it to complete the effect. The walls and floors are elegantly clad in a yellowish marble materials, giving it a sort of aged appeal. Black combined with red-toned woods are really perfect and exudes a masculine appeal which also gives a very Asian look. As such the color combination of this bathroom is mainly black (found on the vanity counter, sides of bathtub, towel rack and window frames) and mahogany which is the color of wood veneer used on the walls. 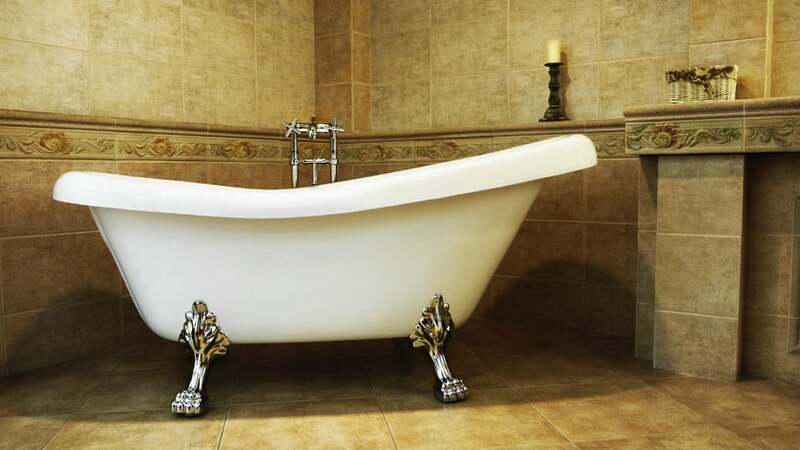 This is a very simple and classy bathroom design which puts its emphasis on the bathtub. 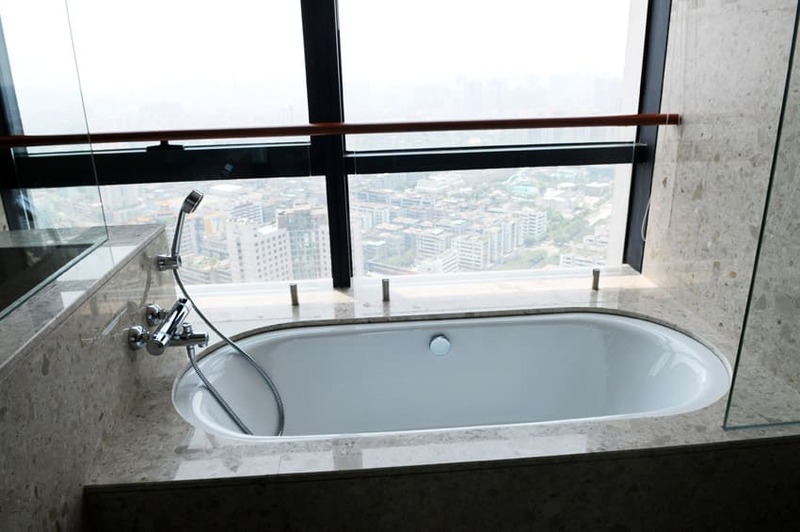 As you can see, most materials are pretty simple and low-key, like the small diamond-shaped tiles for the floors with natural stone texture in a light creamy yellow color, and a similar colored stone in satin finish used to surround the elevated bathtub. 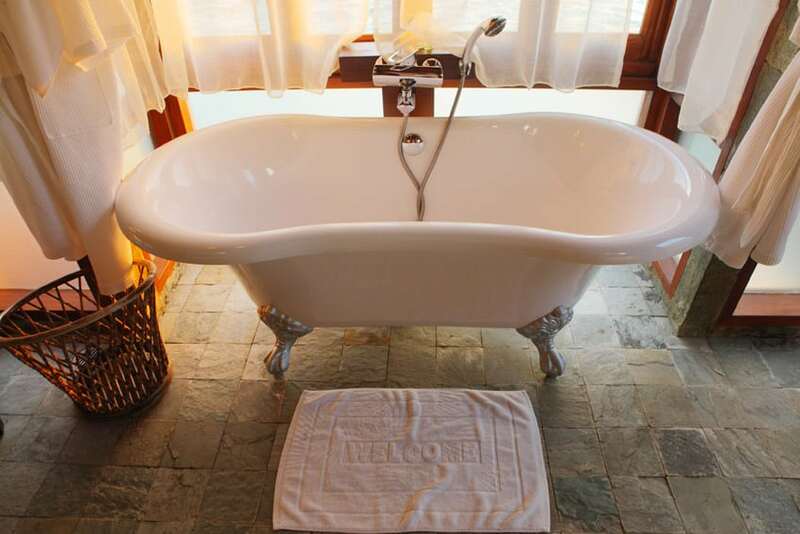 The sides of the tub was clad with paneled wood in a red Mahogany tone, and its dark color helps emphasize the stone surface surrounding the tub and the white tub itself. 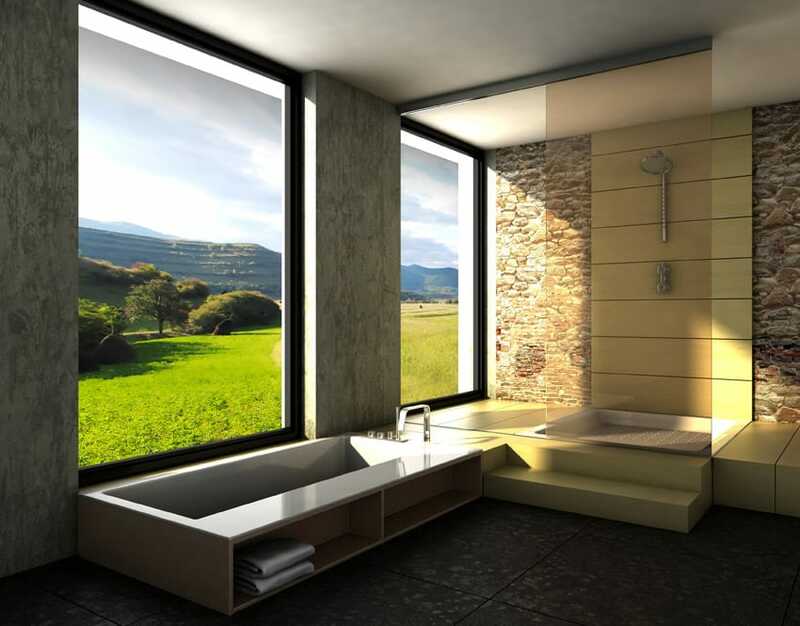 With two large windows, this bathroom is surely light and bright-looking, more so because of its choice of colors. 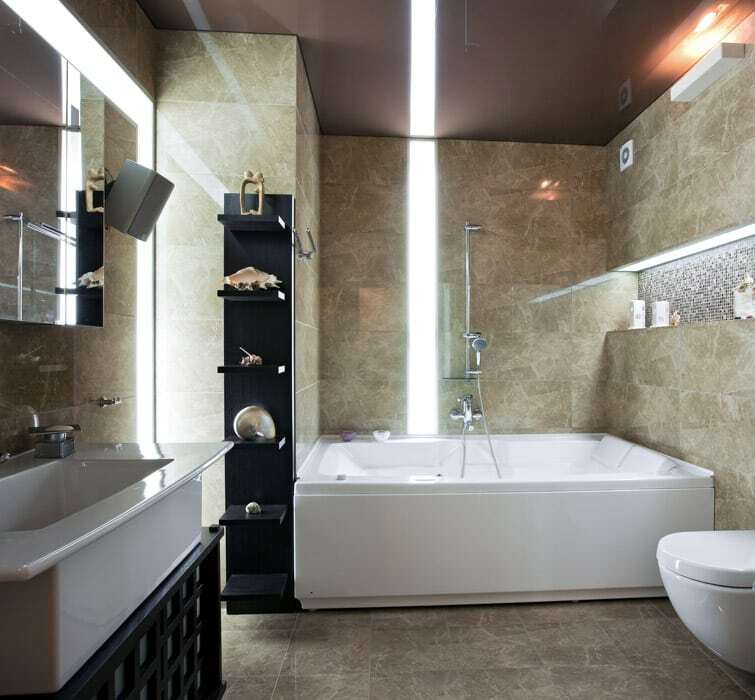 Floors, walls and even the sides and surrounding surface of the bath tub is clad with the same light beige natural stone tiles in a satin finish. There isn’t much other colors in the bathroom other than the Maple wood counter/shelves of the vanity, and despite the over-all simplicity, it creates a very pleasing and easy-to-achieve look. Bright bathrooms look refreshing and instantly look good despite simple styling and materials. Like in this example, you will see how there is a very large picture window right beside the bathtub, overlooking the pool area. Not only does it make the bathroom look bright and refreshing, but it also gives an illusion that the tubs extends towards the pool. 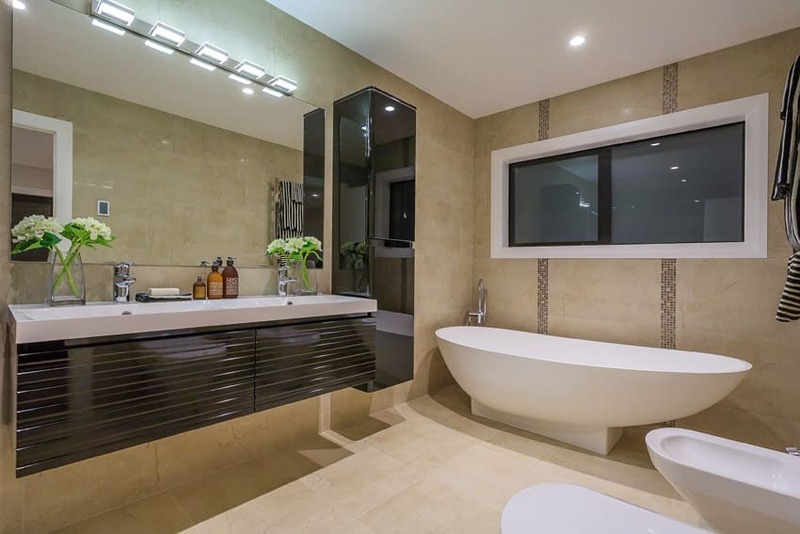 This bathroom emphasizes on one material and that is the very unique granite used on the floors, the walls and even the vanity counter. 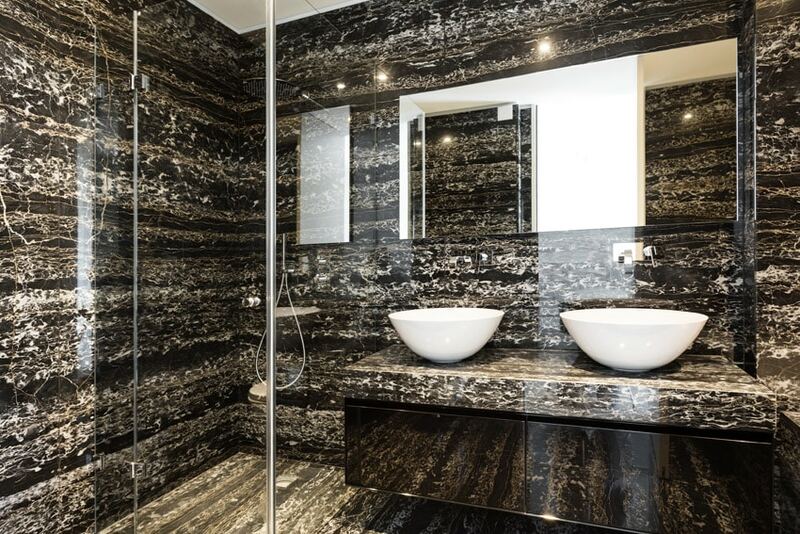 Since this granite is black with white veins and details, this bathroom is a little on the dark and masculine look, and it is complemented by the black mirror-finish cabinets used for the vanity. Thankfully, the space is well-lit, so despite the dark-colored material, the space is bright enough. Because of the choice of material style and color, this bathrooms feels like it’s straight out of old mansions or palaces. You will see that the ceramic tiles used on the floors and walls have various tones, but are all around the color beige – some more yellow, red and neutral than the others. The color selection already has an “aged” feel to it, but the texture/pattern of the tiles used also contribute greatly to achieve this look. 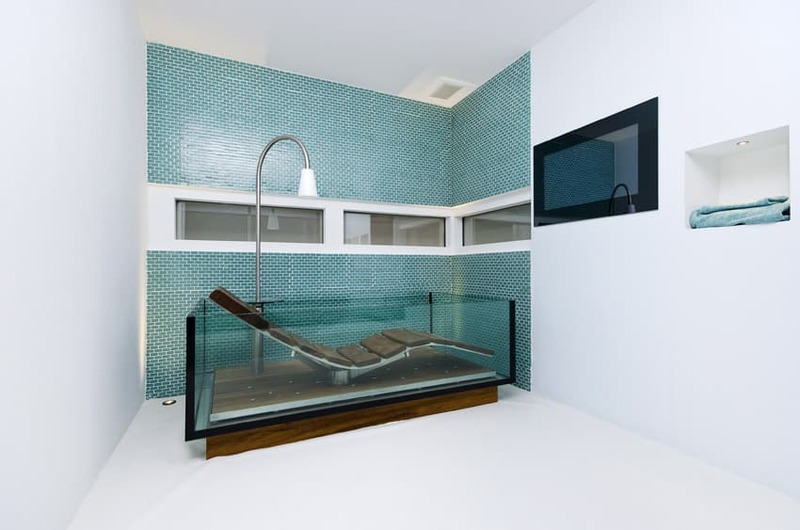 The free-standing bathtub used in this design perfectly matches the concept, too. This bathroom could be described as bright and inviting. 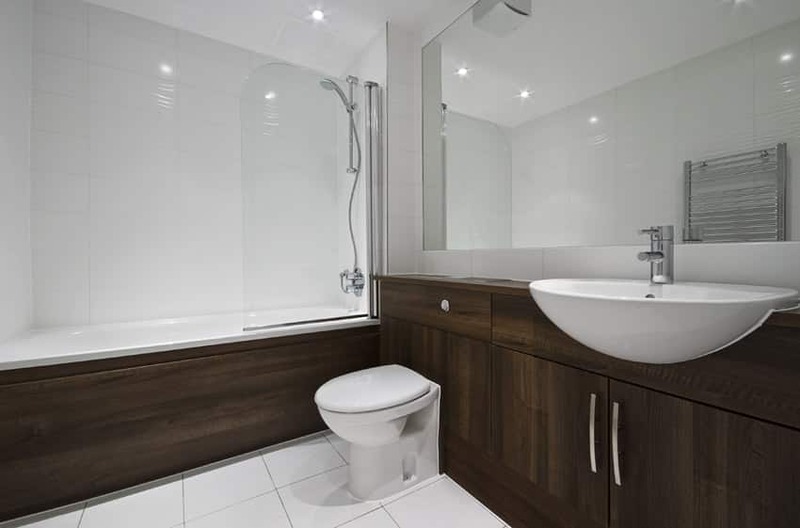 The small bathroom space is well-light, with lots of natural sunlight, which already makes it look bright. It also uses a very light colored floor tiles with gentle beige/gray streaks to give it a little texture and add dimension to the space. There’s two large frame-less mirrors on the vanity, and between them is a white-sliver metallic wallpaper which gives the white walls a little twist. The darkest element of this bathroom would be the laminated vanity drawers. 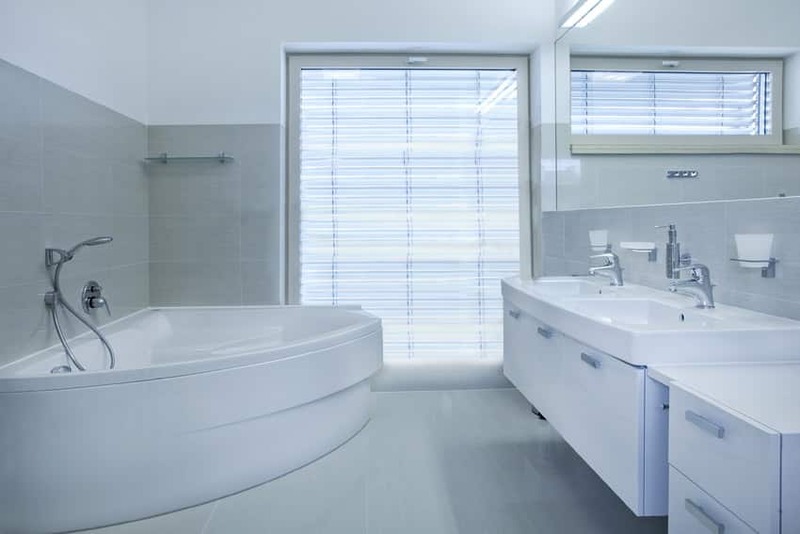 All-white bathrooms can also benefit from adequate natural lighting. Flat white colors tend to be a bit bland or have a bluish undertone which can make your bathroom look cold and uninviting, but natural light helps bring in natural warmth into the space. This bathroom is mostly modern, with very simple panel details on the vanity and the mirror area. The only non-pure white materials would be the off-white quartz stone counter top and splash board, and the wengue wood floors. This experiments on blending warm colors with cool colored-materials, and as such, combines black galaxy granite and cream beige walls. 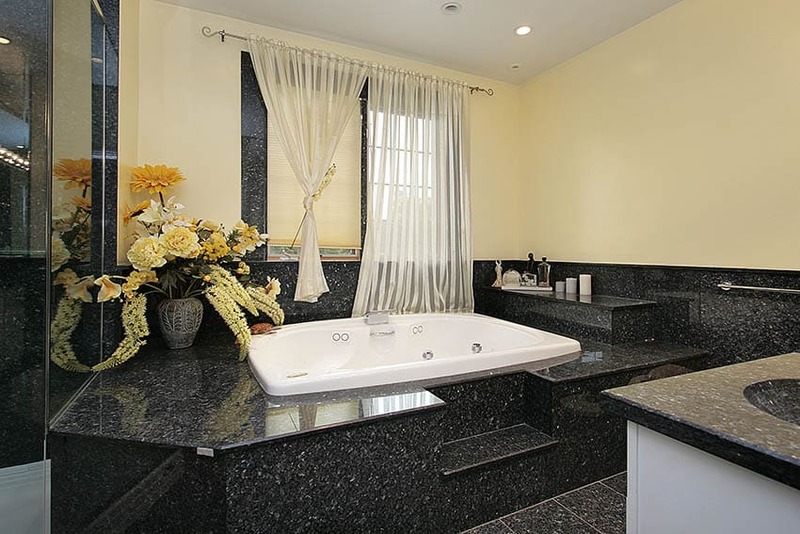 You will see that this particular black galaxy stone used on the floors, counter top and around the bathtub has small flecks of blue, giving it a cooler tone than the usual neutral tone it gives, and this contrasts nicely with the beige color used on the walls. This bathroom us quite small, and so as to not make it look any smaller, one materials us used throughout the bathroom instead of a variety. 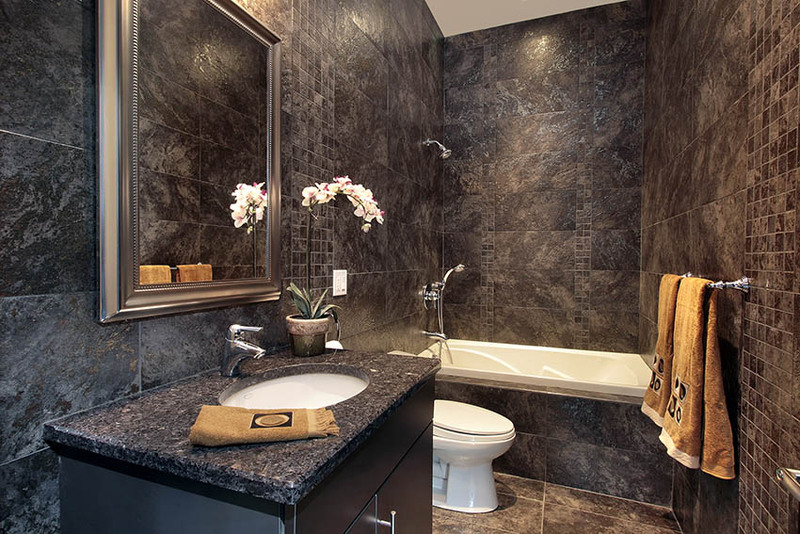 The same black ceramic tiles with textured surface design was used on both floors and walls, but using too much of the same tend to make bathrooms look bland, so in order to mix it up without using a different material, a mosaic tile version of the material was used as accents and borders on the walls. 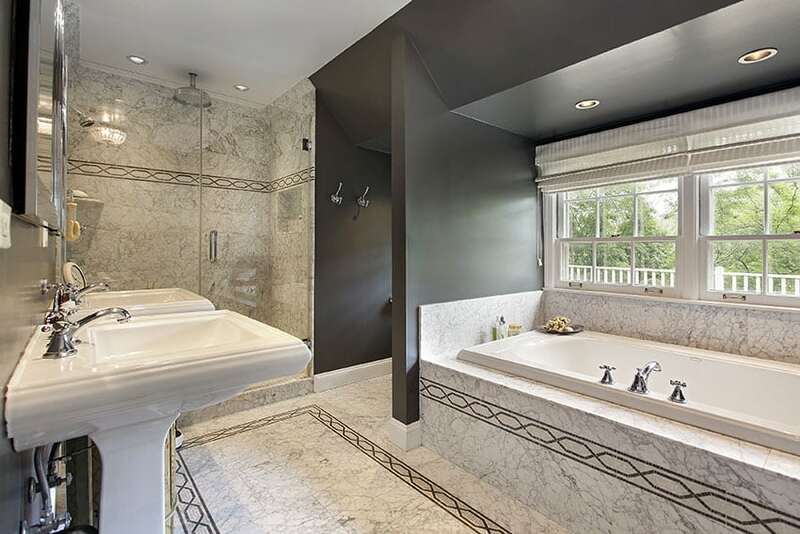 What’s unique about this bathroom is the combination of marble with dark gray walls/surfaces. Usually, classic materials like marble is paired with white, beige or creamy yellow walls, but in this case, it boldly combines it with a more contemporary choice of color, which is a neutral shade of dark gray. You will see that this bathroom uses a variety of different natural stone tiles, not necessarily with the same color family and size. This is being applied on both the floors and the walls, and even surrounding the tub. What makes this bathroom even more interesting is the use of bold red paint on the upper half of the wall. 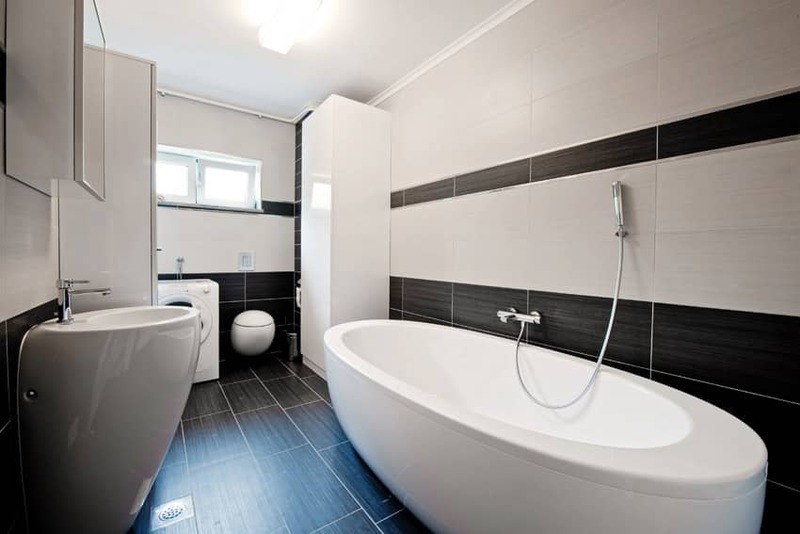 This is an average-sized bathroom with a simple but pleasing choice of colors and materials. It sticks to the basics for its walls and floors – off-white ceramic tiles for the floors and walls with a little texture, and a nice linen wallpaper in a very light off-white color on the walls not exposed to too much moisture. The vanity counter is laminated in maple giving it a nice warm yellow tone, and you will also notice how the low placement of the recessed bathtub help heighten the whole space. This is another bathroom which uses a nice neutral palette, focusing on beiges and browns. You can see the marbled texture of the beige floors used which looks good against the lighter cream tiles used on the walls. The cladding of the recessed bathtub is tiles with a faux oak finish, adding a darker element in the space, as well as adding into the variety of natural textures. This modern bathroom is very simple and plain, with mostly white surfaces. 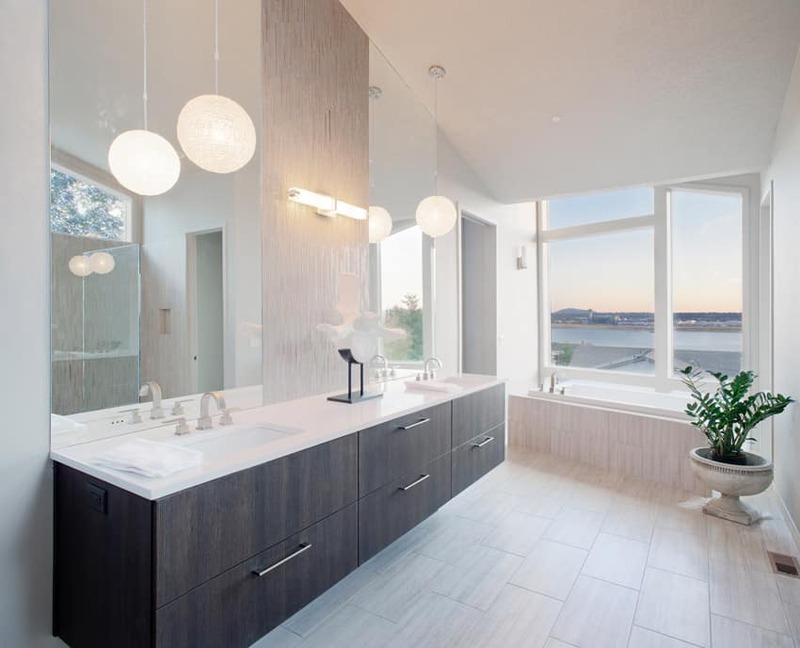 But what helps improve the look of the small bathroom is its use of solid Walnut for the vanity (including the counter top) and the fascia of the bathtub. The natural color of the wood not only adds a warm color into the space it also gives it more texture. This modern bathroom tastefully combines a variety of colors and materials to achieve this look. Starting from the basics, you will notice the use of charcoal-colored ceramic tiles on the floors and most of the walls. This sets a dark but, neutral and contemporary background into the design. The beige mosaic tiles used in the shower area serves as the lightest surface material in the bathroom and neutralizes the charcoal-colored tiles, while the wood laminated used add a touch of natural appeal and texture into the space. Large windows and glass doors helped make this all-black color scheme work for this bathroom. You will see that it uses natural stones with natural surface finish for its walls and floors, while the shower area uses mosaic tiles in dark charcoal color of its walls to help add variety. The choice of fixtures, colors and materials in this small bathroom intend to give an elegant appeal to this design. Five colors of ceramic tiles were used in this design, the lightest of which is on the walls which serves as the “Accent wall” close to the tub, following it are the tiles with floral designs behind the vanity, then the beige floor tiles, and finally, the neutral brown walls tiles and border tiles. The combination of browns work well together and give the space an “antique” look, especially combined with the style of vanity, mirror and bathtub used.